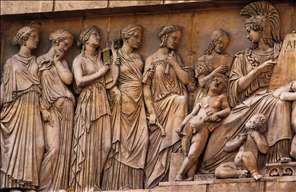 Swiss sculptor, painter and composer, also known as Jean-Jacques Pradier. (His birth is sometimes listed as 1790.) Prompted by his early displays of artistic talent, Pradiers parents placed him in the workshop of a jeweller, where he learnt engraving on metal. He attended drawing classes in Geneva, before leaving for Paris in 1807. By 1811 he was registered at the cole des Beaux-Arts and subsequently entered its sculpture competitions as a pupil of Franois-Frdric Lemot. A more significant contribution to his artistic formation around this time was the guidance of the painter Franois Grard. 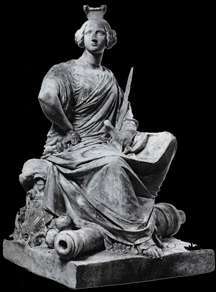 Pradier won the Prix de Rome in 1813 and was resident at the French Academy in Rome, from 1814 until 1819. On his return to France, he showed at the Salon of 1819 a group Centaur and Bacchante (untraced) and a reclining Bacchante (marble; Rouen, Muse des Beaux-Arts). The latter, borrowing an erotically significant torsion from the Antique Callipygean Venus, opens the series of sensuous Classical female subjects that were to become Pradiers forte. 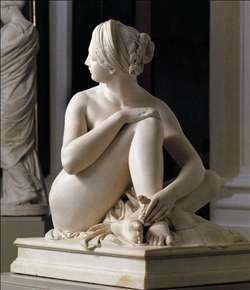 In Psyche (marble, 1824; Paris, Louvre) new ingredients were added to Pradiers references to the Antique. The sophisticated posture and coiffure, and the contrast between flesh and elaborately involved and pleated drapery, are features that recur in most of Pradiers female subjects. The cool Neoclassical surface finish of his sculptures are charged with an eroticism that their mythological themes can barely disguise. At the Salon of 1834, Pradier s Satyr and Bacchante created a scandalous sensation when the prudish government of Louis-Philippe refused to purchase it. (It is now in the Louvre). Other famous sculptures by Pradier are the figures of Fame in the spandrels of the Arc de Triomphe, Paris, and his twelve Victories inside the dome of the Invalides. He is buried in the Père-Lachaise cemetery in Paris. See more details about "Odalisque (front view)"
See more details about "Odalisque (rear view)"
See more details about "Public Education"
See more details about "The City of Strasbourg"